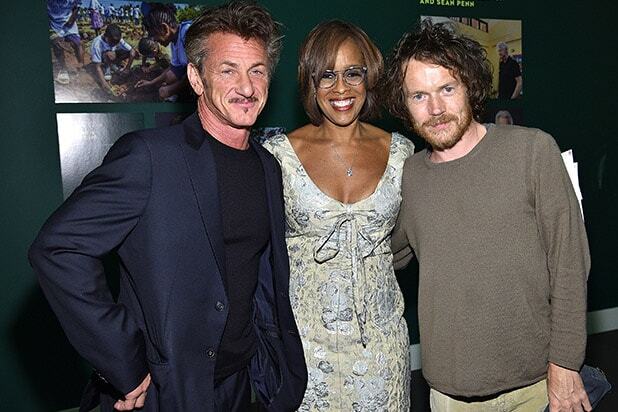 Sean Penn netted $1 million at his first Haiti Takes Root Benefit at Sotheby's in New York. Gayle King (center, with Damien Rice) emceed for a crowd that included Andy Cohen, Ellie Goulding and Donna Karan.CAA chief Bryan Lourd co-hosted. 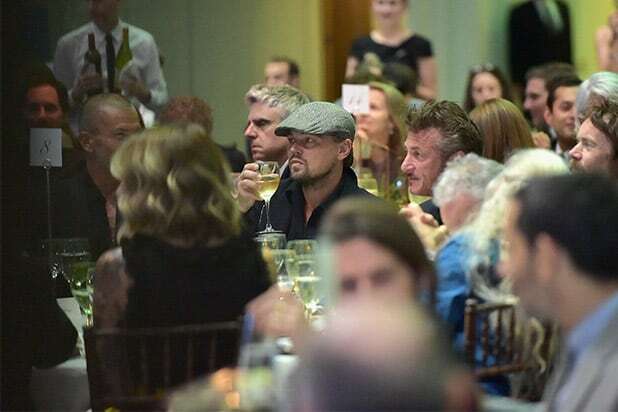 Leonardo DiCaprio put a five star dinner outing with himself up for auction. He also bid on -- and won -- a "soccer experience" with Cristiano Ronaldo. Back in L.A., Jessica Alba celebrated her birthday with a healthier option than cake and ice cream: She hosted a "Sweaty Betty" ride at Cycle House in West Hollywood. Jessica's bike pack included Kelly Rowland and Baby2Baby founders Kelly Sawyer and Norah Weinstein. Keeping a low profile since Oscar night, Faye Dunaway turned up with star Diane Lane at the L.A. premiere of the Eleanor Coppola-directed "Paris Can Wait" at the Pacific Design Center on Thursday night (May 11.) Sony Pictures Classics released the film this weekend. Over at NeueHouse in Hollywood, Jhene Aiko (with boyfriend Big Sean) became the latest fashion face to revive the "Teva" sandal brand that last peaked in the '90s. The "Bed Peace" singer celebrated her three-shoe collection in the choice locale where young entrepreneurs spend their days plotting their next moves -- the NeueHouse patio lounge. L.A. singer/songwriter Corey Harper played a sold out show at the Hotel Cafe in Hollywood on May 16. The crowd packed in by 8 p.m. to hear his hit "Keeping Me Alive" and a cover of Bruce Springsteen's "I'm On Fire" (inspired by his father, who was in the audience). The Springsteen cover could be a breakout single. Harper will be on the road with prime bookings at Sasquatch, Bonaroo, and BottleRock this festival season. We think he should tour with audio soulmates John Mayer, James Bay, and James Hersey. Ewan McGregor and "Fargo" mastermind Noah Hawley's FX juggernaut is rolling in to the heart of Emmys "For Your Consideration" season. On Thursday night (May 11), they entertained voters with a screening and discussion at the Academy's new Wolf Theatre. Craig Ferguson emceed power lawyer Harold Brown's (right, of Gang, Tyre, Ramer & Brown) big night last week. Brown was named the 2017 Beverly Hills Bar Association's Entertainment Lawyer of the Year. 300 executives, lawyers and industry luminaries filled the Montage Beverly Hills to honor the dealmaker behind Steven Spielberg, Stephen King, Heidi Klum, The Rock, Gwyneth Paltrow and more. Seth Browarnik (center), the one and only photographer and media house for Miami's glamour industries, celebrated his company World Red Eye's 7th birthday with a design district bash on May 6. At right is Browarnik's decades-long co-conspirator, nightlife mogul and Kardashian whisperer Dave Grutman. “I’m so proud at how much WRE has grown throughout the years," Browarnik told guests at the Jungle Plaza bash. "It wouldn't have been possible without the great team we have, and tonight was a celebration of that." The crowd included Lea and Roy Black, Chris Paciello, thoroughbred mogul Belinda Stronach and Browarnik (left), who was on the other side of the lens for a change. Emily Ratajkowski, Victoria's Secret Angel Nadine Leopold and fellow VS face Jasmine Tookes converged on Intrigue to ring in the venue's one-year anniversary last week. ...and continued into David Guetta's booth by night. RL Grime, Diplo and Tyson Beckford (pictured with Guetta) checked in for the anniversary weekend, the start of Wynn Nightlife's peak season that runs until Labor Day. Meanwhile in New York, Wyclef John showed off his gym muscles by power pressing LinkedIn Executive Editor Dan Roth at the networking site's HQ. In town for next week's ABC Upfronts where she'll reveal her new show "The Mayor," Lea Michele (right) celebrated National Hummus Day on Friday (May 12) with pals at a Sabra event. The rest of America finally found out "What Happens at the Abbey" on Sunday night (May 14). The world famous West Hollywood gay bar has finally gotten the glossy reality-show treatment on E!, debuting with a social-media-fueled cast party while the premiere aired on the east coast. Only days after being sentenced to prison for bankruptcy fraud, "Dance Moms" Abby Lee Miller welcomed fellow business owner-boss David Cooley to "on-air" status. The show airs Sunday nights at 10 p.m. ET/PT on E! Cooley founded the Abbey in 1991. Then and now, it remains a bakery and coffee shop, even with its LED walls and VIP tables. The institution celebrated 25 years in business at a gala bash last May. At the premiere bash this week, Perez Hilton came to support. Cooley's new spot (appropriately, "Cooley's") is coming to West Hollywood soon. The night before, Jonas Blue headlined a special concert in the heart of Hollywood. Blue and Calum Scott played "Fly to the Beat", a new concert series co-produced by American Airlines and Universal Music Group and Brands. After this kickoff show at the Capitol Records building in Hollywood, Blue jumped an American jet to Hong Kong to play for his fans there. The airline-music company tag-team is aimed at connecting UMG artists with their first-ever shows in international markets.